You might be surprised by this, but my home state of Illinois is one of the most, if not the most, earthquake-prone states in the entire country. The New Madrid Seismic Zone and Wabash Valley Seismic Zone, a pair of intraplate seismic zones (i.e., fault systems within one of the tectonic plates that make up Earth’s crust, in this case, the North American Plate) provide a significant threat of earthquakes to a region including parts of Arkansas, Illinois, Indiana, Kentucky, Mississippi, Missouri, and Tennessee. The New Madrid Seismic Zone, the better known of the two seismic zones, extends roughly from the southernmost part of Illinois to the Memphis, Tennessee metropolitan area, and any large earthquake in this region would significantly affect parts of Arkansas, Kentucky, Illinois, Mississippi, Missouri, Tennessee, and other states further away from the New Madrid Zone. 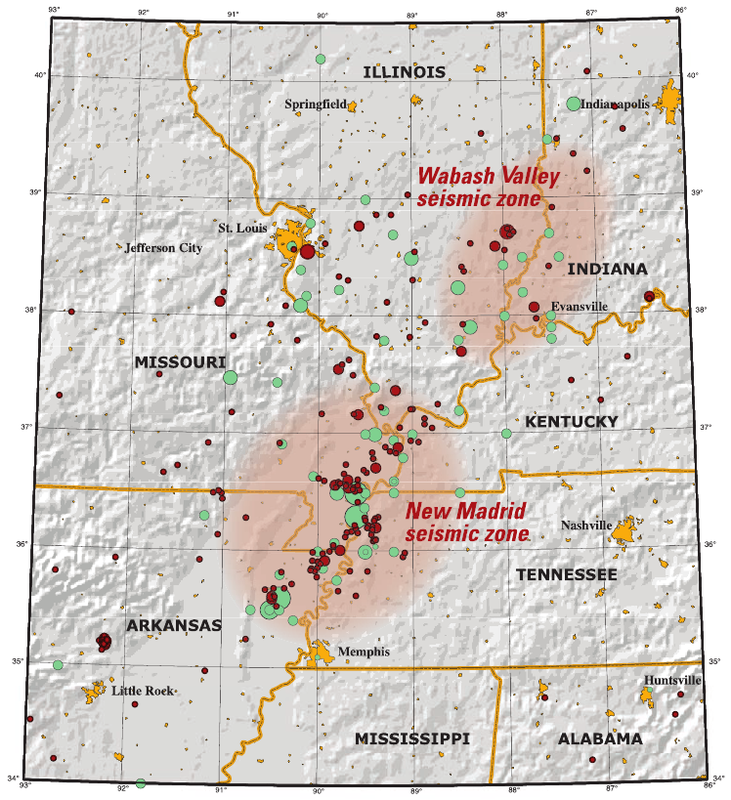 The Wabash Valley Seismic Zone, the lesser known of the two seismic zones, extends roughly along the Wabash River from Terre Haute, Indiana southward, and any large earthquake in this region would significantly affect parts of Illinois, Indiana, Kentucky, and other states further away from the Wabash Valley Zone. However, there’s two main factors that would make a large earthquake in this region of the country, which hasn’t happened since 1812, even more devastating than an large earthquake in other areas of the country. First, since virtually all homes, buildings, and other structures in this region of the country are not built or retrofitted to withstand large earthquakes, the devastation that would be caused by a large earthquake in this region of the country would be considerably worse than the devastation that a large earthquake in, for example, California would cause. Second, because of the geology of this region of the country, any large earthquake in this region of the country would be felt over a wider area than an earthquake in, for example, California would be. If a 7.7 or greater magnitude earthquake were to occur in either the New Madrid or Wabash Valley seismic zones, it would be one of the worst natural disasters in modern U.S. history. Most, if not all, structures near the epicenter of the earthquake would be destroyed. Roads, bridges, railroads, power lines, power plants, water lines, water pumping and treatment facilities, and other types of infrastructure would be damaged or destroyed for tens, if not hundreds, of miles around the epicenter, many local radio and television stations in the region would likely be knocked off the air for days, if not even longer, sand blows and soil liquefaction would occur in some areas in the region, large rivers in the area, such as the Mississippi, Ohio, and Wabash, could be moved off of their current courses by upwards of two miles, if not even further, fatalities would likely be in the thousands, injuries would likely be in the tens of thousands, if not hundreds of thousands, the earthquake would probably be felt as far away as places like Boston, Massachusetts, Duluth, Minnesota, and Denver, Colorado, and at least minor damage could occur in places as far away as Madison, Wisconsin, Columbus, Ohio, New Orleans, Louisiana, and Wichita, Kansas. The areas within and near the New Madrid and Wabash Valley Seismic Zones, which includes parts of several states in the Lower Midwest and South, including my home state of Illinois, are some of the most earthquake-prone areas in the entire country, and that’s something that many people don’t realize.